WHAT WILL IT TAKE FOR ACTION? This is the lower San Joaquin River, which has so much water diverted that it runs dry (Photo taken June 20, 2014 by John Sutter/CNN). ...delayed its vote on Phase 1 of the Water Quality Control Plan for another 35 days. A late hour letter from Governor Brown and Governor-Elect Newsom, requesting a delay, was only the latest in a number of plot twists and turns in this water soap opera. Just a week earlier, the San Francisco Board of Supervisors had voted to approve a resolution supporting the State Water Board's plan, only to have it vetoed by Mayor London Breed just hours later. Phase 1 of the Water Quality Control Plan covers updated water quality standards for the lower San Joaquin River and its three major tributaries: the Merced, Stanislaus, and Tuolumne Rivers. The upper Tuolumne River as it flows through Yosemite National Park. Downstream, over 75% of the water is frequently diverted for use by the City of San Francisco, parts of the South Bay, and agriculture (photo credit: Water Education Foundation). 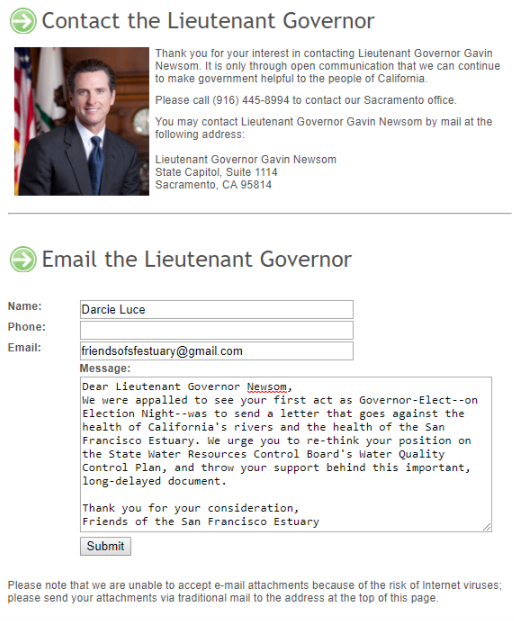 The beleaguered State Water Board is encountering opposition to its timid plan on all sides. The San Francisco Public Utilities Commission (SFPUC), the City of San Francisco's water and power agency, has been pushing its own plan, which focuses on restoration projects along the Tuolumne River without increasing the river's flows. However, the amount of water diverted from the Tuolumne, as well as the other rivers under the plan, is so large--almost 80% of the river on average--that it begs the question of how the Tuolumne and its endangered salmon run could possibly be restored to health without an increase in flows. The SFPUC's position, backed by Mayor Breed, creates an odd set of bedfellows, as it sides with agricultural irrigation districts, the Brown administration, and the Trump administration. This unholy alliance leaves environmental groups--including Friends of the San Francisco Estuary--in the odd position of supporting a plan that does not go far enough to revive these vital arteries of the San Francisco Estuary. We'll keep you posted on our current work, successes, and important events, as well as inform you of opportunities for greater involvement.